After looking at something bright, such as a lamp or a camera flash, you may continue to see an image of that object when you look away. This lingering visual impression is called an afterimage. Cut a small hole in the piece of cardboard. This hole can be any simple, recognizable shape, such as a square, circle, or triangle (see photo above). Place a layer or two of frosted transparent tape over the hole you just cut out (this will help to diffuse the light from your flashlight). 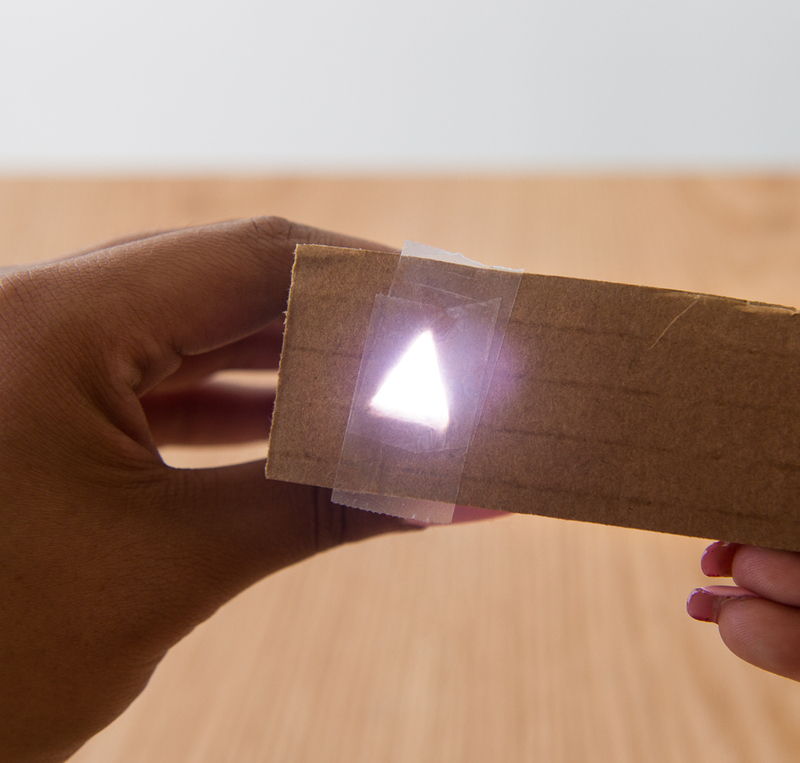 In a darkened room, place the flashlight directly behind the hole in the cardboard so the beam shines through the hole. Test to make sure stray light doesn't come through other parts of the cardboard. Holding your set-up at arm’s length, turn on the flashlight and shine it into your eyes. Stare at one point of the brightly lit shape for about 30 seconds. Then stare at a blank wall and blink a few times. Notice the shape and color of the image you see. Try again, first focusing on the palm of your hand and then focusing on a wall some distance from you. Compare the size of the image you see in your hand to the image you see on the wall. You see because light enters your eyes and produces chemical changes in the retina, the light-sensitive lining at the back of your eye. Prolonged stimulation by a bright image (here, the light source) desensitizes part of the retina. When you look at the blank wall, light reflecting from the wall shines onto your retina. The area of the retina that was desensitized by the bright image does not respond as well to this new light input as the rest of the retina. Instead, this area appears as a negative afterimage, a dark area that matches the original shape. The afterimage may remain for 30 seconds or longer. The apparent size of the afterimage depends not only on the size of the image on your retina but also on how far away you perceive the image to be. When you look at your hand, you see the negative afterimage on your hand. Because your hand is near you, you see the image as relatively small—no bigger than your hand. When you look at a distant wall, you see the negative afterimage on the wall. But it’s not the same size as the afterimage you saw on your hand. You see the afterimage on the wall as much bigger—large enough to cover a considerable area of the wall. The afterimage is not actually on either surface—it’s on your retina. The actual afterimage does not change size. The only thing changing is your interpretation of its size. Another thing you can try when doing this Snack is to close your left eye and stare at the bright image with your right eye. Then close your right eye and look at the wall with your left eye. You will not see an afterimage. Negative afterimages do not transfer from one eye to the other. This indicates that they are produced on the retina and not in the visual cortex of the brain, where the signals would have been fused together. For up to 30 minutes after you walk into a dark room, your eyes are adapting—after that time, your eyes may be up to 10,000 times more sensitive to light than they were when you entered the room. We call this improved ability to see night vision. It’s caused by the chemical rhodopsin in the rods of your retina. Rhodopsin, popularly called "visual purple," is a light-sensitive chemical composed of retinal (a derivative of vitamin A) and the protein opsin. Cover your eyes to allow them to adapt to the dark. Be careful that you do not press on your eyeballs. It will take at least 10 minutes to store up enough visual purple to take a “snapshot.” When enough time has elapsed, uncover your eyes. Open your eyes and look at a well-lit scene for half a second (just long enough to focus on the scene), then close and cover your eyes again. You should see a detailed picture of the scene in purple and black. After a while, the image will reverse to black and purple. You can take several snapshots after each 10-minute adaptation period. The phenomenon of afterimages may also help explain a common illusion you might have noticed. The full moon often appears larger when it is on the horizon than when it is overhead. The disk of the moon is the exact same size in both cases, and its image on your retina is also the same size. So why does the moon look bigger in one position than in the other? One explanation suggests that you perceive the horizon as farther away than the sky overhead. This perception might lead you to see the moon as being larger when it’s near the horizon (just as the afterimage appeared larger when you thought it was on a distant wall), and smaller when it’s overhead (just as the afterimage appeared smaller when you thought it was in the palm of your hand).